30 years experience of replacement glass, misted up or broken. Also fixing or replacing any upvc furniture. And now fitting upvc Windows and doors. 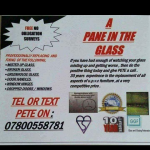 "Fantastic service from a pane in the glass just purchased an old house that had a number of failed units . A Pane in the Glass came out and offered a price I couldn't refuse."